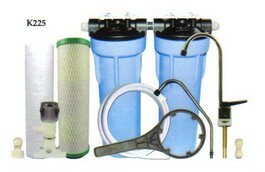 The most popular, advanced and altogether complete multistage filtration unit. The ametek heavy metal removal system incorporates ultra fine particle filtration (0.5 micron) and a chemical/ heavy metal reducing mixed media filter cartridge. 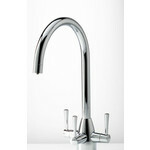 The HM Unit fits simply under the sink, installation requires the drilling of the work-surface or sink-unit to accommodate the ancillary drinking water tap, the suspension of the filter by screwing the bracket to the side of the cabinet and connecting into the cold water by attaching the self-piercing saddle valve. Removes: - algae, benzene, chlorine, aluminium, barium, EDB's, herbicides, OCB's, cadium, chloride, pesticides, petroleum solvents, chromium, copper, rust particles, sand, silt, lead, magnesium, zinc, mercury, silver, taste & odour, THM's and cysts.